There’s several ways of preparing this curry in Sri Lanka; the most common preparation is as a “white curry”. In Sri Lankan cuisine, white curries are less spicy, prepared to complement the spicier meat/fish curries. Pumpkin, or wattakka in Sinhalese, is also prepared as a spicier curry, incorporating roasted curry powder, which gives this particular preparation a darker curry. I prefer the less spicy version; the “white pumpkin curry” and today’s blog post will be based on that. Pumpkin curry is relatively easy to prepare and is a curry thickened through the use of ground rice and freshly grated coconut. It’s perfect for those warm wintry days! 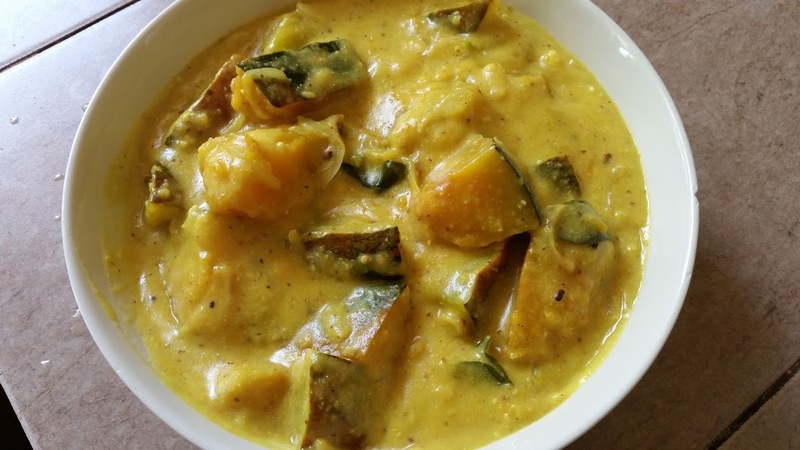 The recipe is adapted from Yvonne Fernando’s recipe for Pumpkin White Curry. The pumpkin can be used either with the skin or without. The pumpkin can either be used with or without the skin. I generally keep the skin on. The pumpkin cubes don’t need to be a specific size. I chop them into medium-large chunks. Grind the cumin, pepper, rice and mustard together in a food processor. Add 2 tablespoons of water and grind again. Lastly, add the coconut and garlic and grind again. Set aside. In a pan, add the pumpkin and all the other ingredients, except for the coconut milk. Add a teaspoon of salt. Add enough water to cover the pumpkin in the pan, and a 1/4 cup of coconut milk. Cook, until the pumpkin is tender and gravy has reduced to very little. Leave the pan covered during this time. The pumpkin will cook in a few minutes. Mix the previously ground ingredients with a little of the coconut milk and add to the pumpkin. Add the rest of the coconut milk and cook, uncovered. Let the gravy simmer for a few minutes and remove off the heat. The pumpkin should be nestled within a thick coconutty gravy, bursting with the aromas from the addition of the freshly ground spices. While the list of ingredients may appear daunting, the curry is relatively easy to prepare; a one-pot curry pretty much. Enjoy in hot with some steamed rice. Bon Appetit!